Hurry into Battery on Paces Ferry! Only three Atlanta townhomes are left with nine sales in June. This is your chance to own an elegant, energy efficient home in historic Vinings, just minutes to Buckhead and downtown Atlanta. These homes priced from the mid $300,000s in a gated community will not last long! The townhomes feature three bedrooms and three-and-a-half baths with inviting front porches, gorgeous dining rooms, spacious family rooms and gourmet kitchens. The gourmet kitchen offers granite countertops, stainless steel appliances, large pantries and beautiful cabinetry. Trey ceilings, oversized walk-in closets and bathrooms with dual vanities, garden tubs and walk-in showers are in the gorgeous master suites. Community amenities include a community swimming pool and nearby recreations like the Cobb Performing Art Centre, Chastain Park Amphitheater, The High Museum, the Atlanta Botanical Gardens, the Atlanta History Center, The Fox Theatre and the Silver Comet Trail. Students residing in Battery on Paces Ferry attend Teasley Elementary, Campbell Middle and Campbell High schools. Take a tour today, and experience how these energy efficient homes combine a superb lifestyle with an amazing location. 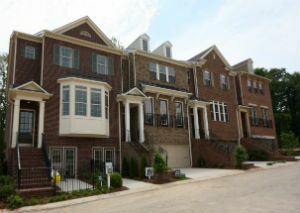 For more information on these Atlanta new homes, call 770-435-9377 or visit www.ashtonwoods.com/atlanta. This entry was posted in Energy Efficient, Green News, News and tagged ashton woods homes, atlanta new homes, atlanta townhomes, battery on paces ferry on July 18, 2012 by Carol Morgan.